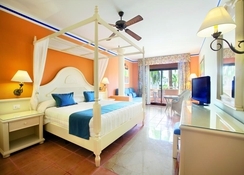 Grand Bahia Principe Punta Cana is a family-friendly entertaining sanctuary. 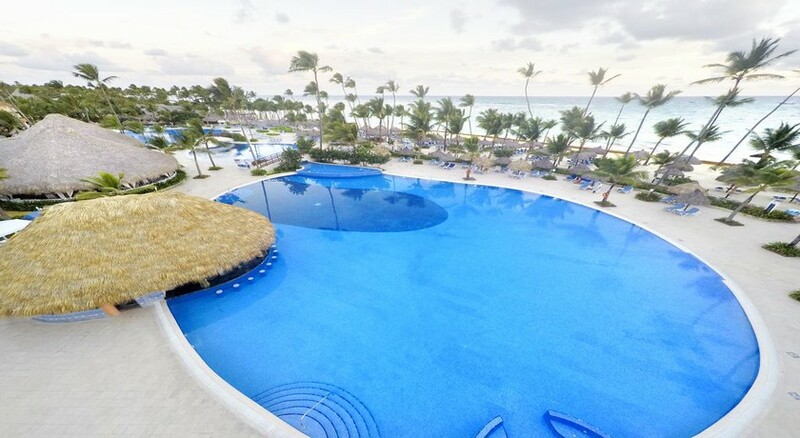 With 744 well-appointed rooms and suites, 2 enormous pools, a children’s water park, 6 restaurants, 4 bars, a discotheque and Wi-Fi facilities throughout its premises, the hotel is certainly the best place to spend your summer vacation in this Dominican Republic resort. 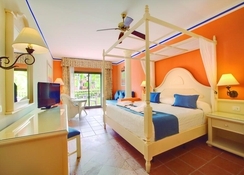 Located near the coastline of Bavaro Beach, the hotel lets you enjoy the best of the Caribbean. Its beautiful location right on the waterfront with large spaces and lush tropical gardens will make you fall in love with this little bit of heaven. Guests can enjoy the hotel’s all-inclusive package that gives you access to a range of facilities. There are a lot of activities on site that will keep you engaged from dawn to dusk. Pamper yourself at the luxury spa, tee off at the golf course, unwind on the Bavaro beach, or take your kids for a fun-filled day at the water park that comes with waterslides and themed swimming pools. Grand Bahia Principe Punta Cana is the perfect place for couples, honeymooners and families seeking luxury with affordability. Grand Bahia Principe Punta Cana is right across Playa de Arena Gorda, the most beautiful beach of Punta Cana. Couple of kilometers away is the massive golf course of Cana Bay, which is the perfect place to hone your golfing skills. Iberostar is another golf course that is located on the other side of the hotel. The capital city of La Altagracia Province, Higuey, is an hour’s drive away, while International Airport Punta Cana is a drive of 30 minutes. The hotel offers its guests 744 rooms with a host of amenities such as balcony/terrace, mini bar, LED satellite TV, hydro massage bathtub, bath amenities, telephone and safe. The rooms have either 2 full-sized beds or 1 king-sized canopy beds. The rooms are Wi-Fi enabled, which can be used with additional charges. The hotel has an all-inclusive package, which includes buffet, 3 a la carte dinners, entrance to Bachata night club, gym membership, swimming lessons and a wide selection of local drinks. 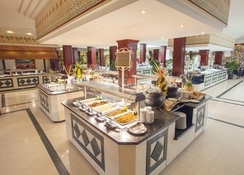 Guests are offered a wide variety of culinary options at Grand Bahia Principe Punta Cana. 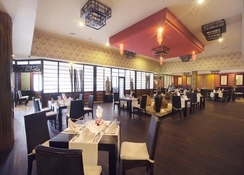 The Bavaro Main Restaurant serve international cuisine buffet and requires a formal dress code. The Beach Restaurant by the seaside is also a multi-cuisine in nature and serves a variety of lip-smacking delicacies. You can also enjoy meals and drinks by the pool at the Pool Restaurant of the hotel. There’s an array of a la carte restaurants serving varied cuisines such as Italian, Japanese, Mexican and Dominican. The hotel also houses a number of pool bars and beach bars offering delicious cocktails and drinks. 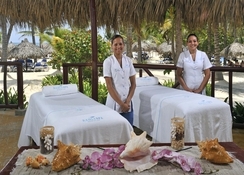 There are a plenty of things to do for all age groups at Grand Bahia Principe Punta Cana. Experience pure tranquility at the hotel’s spa that offers sauna, therapeutic sensation showers, Vichy shower and 2 dynamic pools. Make a splash in the hotel’s massive lake-style pool or take your kids to the exciting on-site water park. Indulge in water sports or simply lounge around in the beach, which is a few minutes’ walk from the hotel. You can also practice golfing in one of the many golf courses of Punta Cana. There are plenty of day trips, which can help you discover the natural beauty of the island. Enjoy exciting nightlife at the hotel with music, dance and theatre on the grounds of the hotel. Allow your kids to make new friends at the exclusive nature club, thrilling fun park and kids’ club.